See scan - perfect condition. Comes with original ribbon of issue. This is a nice and rare socialist / communist era Soviet Russian / USSR Medal for Irreproachable Service in the Armed Forces of the USSR (Ministry of Defence) - 15 years of Perfect Service and Merit. Established 25 January 1958, by the Ministry of Defence, USSR Minister of Internal Affairs (MVD), and Chairman of the USSR State Security Committee (KGB). 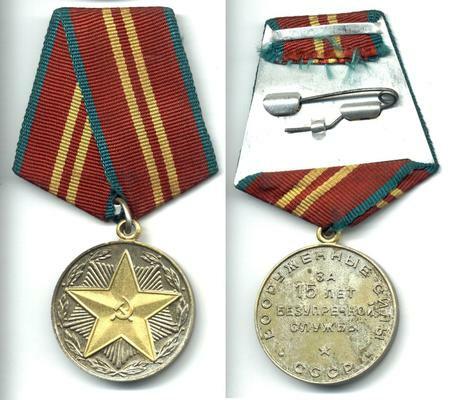 Originally, Soviet awards such as the Order of the Red Star were given to commemorate length of service. These medals were established to reinforce the significance and importance of a length of service award, while keeping the higher awards reserved for uncommon deeds of valor. These medals were departmental, each having issued their own length of service award, with different legends on the reverse. Nice and scarce militaria / military collector piece and one of the rare Russian medals.